Wyatt stood at the door of his home in West Roxbury keeping an eye out for Gabe Harris, who's off at UMass Amherst. In Sudbury, an older Labradoodle named Reuben has been dragging himself up three flights of stairs and plopping himself in front of Kerani Verma’s room — vacant since she left for the University of Delaware — and just waiting. Gracie, a Newton goldendoodle, has put herself on a hunger strike since sisters Rachel and Emma Brown left for post-grad life and Tufts. She spends her nights snoozing near their empty beds. 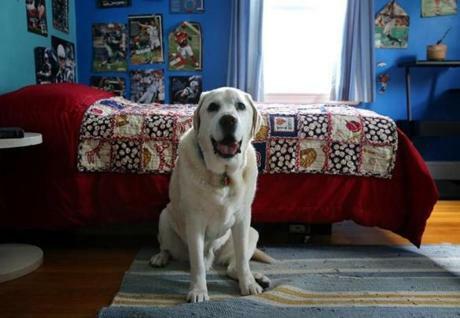 As for Wyatt, a yellow Lab in West Roxbury, he’s been sitting at the base of the staircase, listening for the command he’s been hearing for years — “Go wake Gabe!”— only it’s not coming anymore. Gabe’s left for UMass Amherst. As any dog would tell you if she or he could only speak, it’s not easy being a canine empty-nester. With the school year underway and college students departed, households everywhere are dealing with the unnatural quiet, the empty seat at the dinner table, the curious absence of laundry. Parents and siblings know that the kid will return, that the loss is not forever. But what about the pets who wander the house, hunting for the family member who is — unaccountably — simply gone? No one knows that better than Wyatt, whose belly Gabe used as a pillow when he read comic books, recalled Harris. Her son was 7 when Wyatt joined the family, “and he didn’t want to brush his teeth unless the dog was in the bathroom,” she said. Wyatt at the stairs of his home in West Roxbury. Terri Bright, director of behavior services at MSPCA-Angell , said that not only do dogs “absolutely” miss people, but a depressed dog acts like a person who’s down. They don’t eat as much. They sleep more. They’re not as enthusiastic. “They seem sad, but they can’t tell us,” she said. 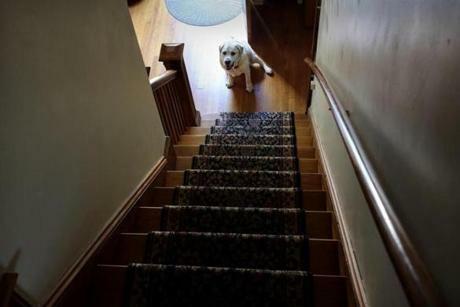 Matt Nelson, the voice behind the popular Thoughts of a Dog and WeRateDogs Twitter accounts, said that when he was away at college, his golden retriever, Zoe, sometimes wouldn’t want to come in at night — she’d wait on the front porch looking down the road for him. “There was no other reason for her to be out there,” he said. 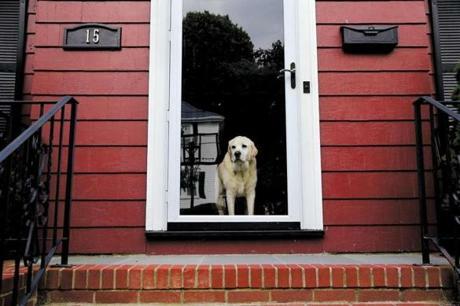 What’s the owner left at home with a floppy and sad pup to do? “Help the dog feel joy in other ways,” said Rachel Locke, the dog whisperer behind Red Rover Ranch , a five-acre boarding and training business in Chelmsford. Gabe Harris and Wyatt on Cape Cod in July 2017. Although people sometimes joke about dogs feeling sad, a dog who loses his primary person can grieve for months, said Borns-Weil, of Tufts. She described a scenario in which the kid heading off to college was the one who played with the dog and walked it the most, and she emphasized the importance of maintaining those activities in the dog’s life. “Sometimes when a dog is saying goodbye to a person they’re saying goodbye to a whole lifestyle,” she said. And here’s one more piece of advice: If you’re the grieving human empty-nester left at home, cheer yourself up, or at least put up a good front. 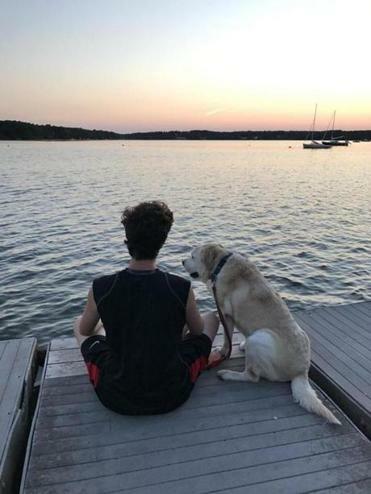 That’s because the dog might not only be missing the departed student but could be picking up on the gloomy mood in the house, said Vivian Zottola, a canine behavior specialist in South Boston. “Sure, the dog is affected, but they’re also responding to mom and dad,” she said. Or . . . you can drive the 90 miles from your home to your child’s school. That’s what Babu Krishnamurthy, a neurologist with Steward Medical Group, did when she realized that the behaviors her elderly German shepherd was exhibiting — lack of appetite and enthusiasm — were signs he was pining for her oldest son, Suri Chavali, away at UMass Amherst. “It took me a week to realize,” she said. Wyatt visited Gabe Harris’s bedroom. Gabe is far away at college. After a few hours, it was time to go. “All right sweetie, I need to get back,” she told Jack.